Elephant ivory figurine, foreground, is from a United States Fish and Wildlife Service display at Boston’s Logan International Airport, cautioning travelers about importing objects made from endangered or protected species. 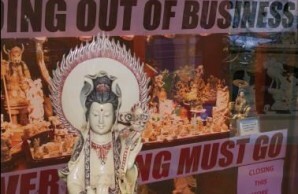 Photograph in background shows objects of elephant ivory, mammoth ivory, and bone for sale in New York City. 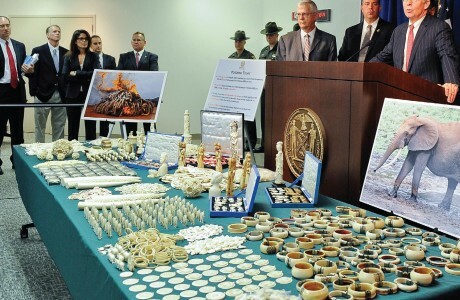 On July 12, 2012, Manhattan District Attorney Cyrus R. Vance Jr. (right) announced guilty pleas of two dealers for marketing illegal elephant ivory with a retail value of more than $2 million.